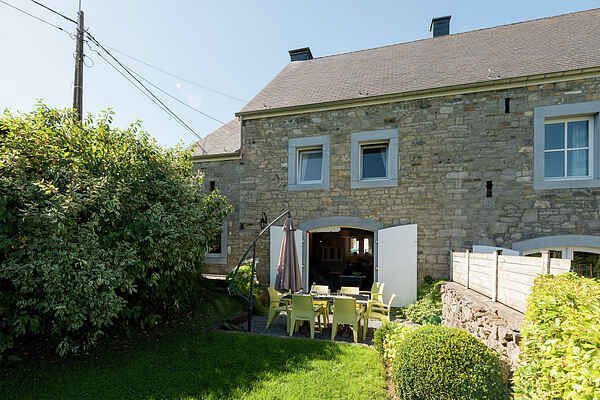 This beautiful farm is situated in the wonderful town of Sprimont, on the outskirts of the Ardennes. It has been very tastefully decorated and there is an infrared sauna. Suitable for families. The very bright living area of the old farm has a seating area with a wood burner and a dining area. There is a modern, open-plan kitchen in the home which has been equipped with all conveniences. In the basement you will find the relaxation room with table football and the lovely infrared sauna. Furthermore, the bedrooms have a spacious layout and there are two bathrooms, one with a bathtub. The farm is adjacent to the owner's residence and it has a beautiful garden with a trampoline. The area offers various activities and sights, such as the longest cave system in Europe in Remouchamps, the zoos of Reid and Deigne and the spa resort of Spa and golf. There are also hundreds of hiking and cycling routes through the hilly landscape. The centre of Sprimont is 1 kilometre from the farm and you will find the town of Aywaille at 6 kilometres. The Baraque de Fraiture ski resort can be found 35 kilometres away.